As part of San Domenico’s Master Plan agreement with Marin County, we must abide by certain traffic restrictions. 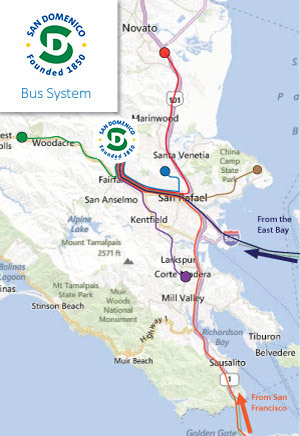 To enable our community to comply with these restrictions, San Domenico administers one of the most extensive school bus route systems in the Bay Area. Riding the bus is a benefit available to all students at all grade levels and is included in the yearly tuition. The youngest children are greeted by teachers at the green awning each morning, ensuring a welcoming and secure arrival at school. At the end of the school day, teachers walk students to their buses, escorting them all the way to their seats.